Dr. Ruth Barthel is a Board Certified Veterinary Dentist. She is one of three in the entire state of Michigan. 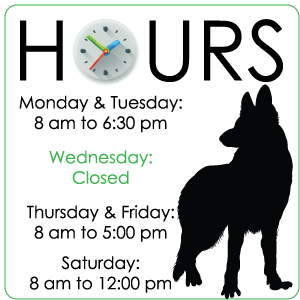 She provides care, routine and advanced for animals from all over the state of Michigan and surrounding states. Most pet owners aren't aware of how much we can do for the oral and dental health of our animals, or how important it is for your pet's overall health and quality of life to have regular dental care. These are some of the questions we often hear when discussing dental health. 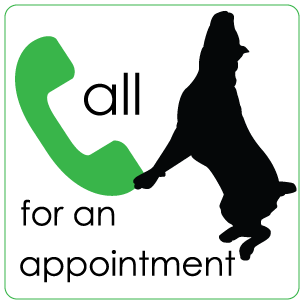 If you still have questions about your pet's oral health, please contact us. What is a Veterinary Dentist and how is that different from what my regular vet does? A Veterinary Dentist is a board certified specialist in oral medicine, surgery and dentistry. This certification requires completing 6 years of training beyond the regular 4 year vet degree, and successful completion of rigorous testing of skills. A Veterinary Dentist can offer you and your pet many advanced treatments such as root canals for broken teeth, in depth treatment of gum disease that might otherwise cause tooth loss, correction of malocclusions/crooked teeth, fillings for cavities instead of extractions, treatment of jaw fractures, removal of tumors in the mouth, and removing teeth that are too difficult for a regular veterinarian. What is routine dental care and why is it important? Routine dental care starts at home with tooth brushing daily! Yes, we have flavored toothpaste so your pet can actually enjoy the teeth brushing! Brushing is best, but other options include Oravet Chews, special dental diets that are harder than normal dry food, Dental specific treats, Plaque removal flakes, and water additives to reduce plaque. Routine care is important because it removes plaque which contains bacteria that, in large numbers, can cause gingivitis, bleeding gums, bad breath, bone loss and tooth loss. A professional dental exam and cleaning is usually done once every year – more or less based on your particular pet’s oral health. What is involved with a routine dental exam and cleaning? A professional dental exam and cleaning involves a thorough look at your pet’s larynx, tonsils, pharynx, soft and hard palate, the base, top and underside of the tongue, lymph nodes, gingival probing for pockets all around each tooth, and a magnified view of each tooth. Once this is done, the teeth are cleaned and polished on the crowns and below the gumline. If needed, we can take digital radiographs (xrays) of the teeth. Each pet also receives a fluoride treatment. My pet eats dry food so why would he need routine dental care? We are very glad that you are feeding dry food, as it does help to reduce tartar buildup. In some pets this may be all that is needed. 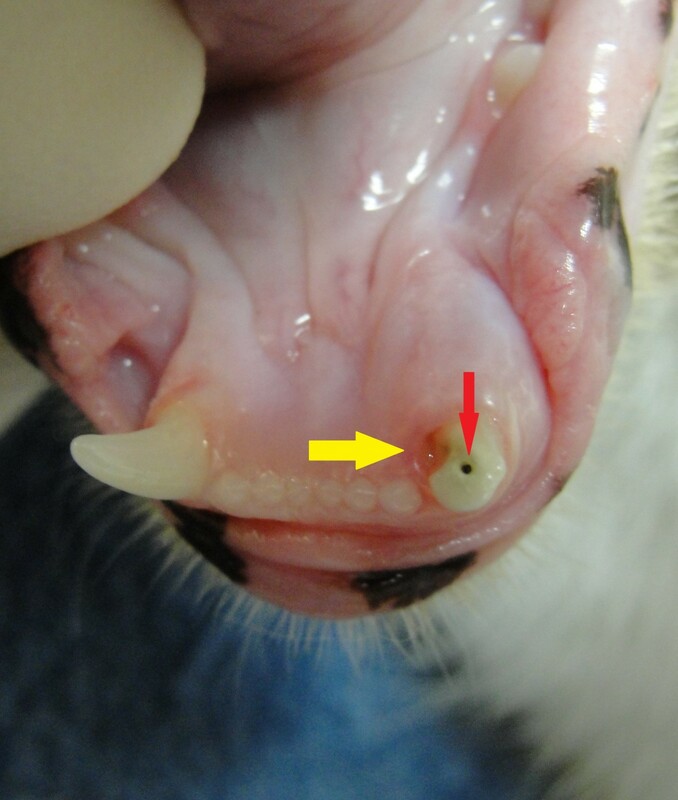 For most pets, dry food alone is not enough to prevent a buildup of soft plaque that then turns into tartar/calculus (the hard brown substance on the crowns of teeth). 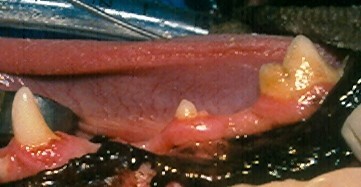 Once the plaque has hardened into tartar, it can only be removed by scaling with dental instruments. Once the tartar is removed the teeth should be polished smooth, just like your teeth are after a cleaning. I brush my dog’s teeth and give her dental chews but now I’m told she needs her teeth cleaned and I don’t understand why. Kudos to you for brushing your dog’s teeth and providing good home care. You are doing everything right! But even for us humans, brushing is not enough and we still develop plaque and tartar that needs to be professionally removed. Your dog is the same – when the plaque, tartar and gingivitis get to a certain point, the mouth will only get worse without having a professional cleaning. I've heard a dental cleaning can be done without anesthesia. Isn't that safer for my pet? It is not safer; it can leave disease and painful conditions undiagnosed. A professional cleaning should involve a thorough oral exam of the larynx, tonsils, pharynx, soft and hard palate and other structures that cannot be seen on an awake pet. 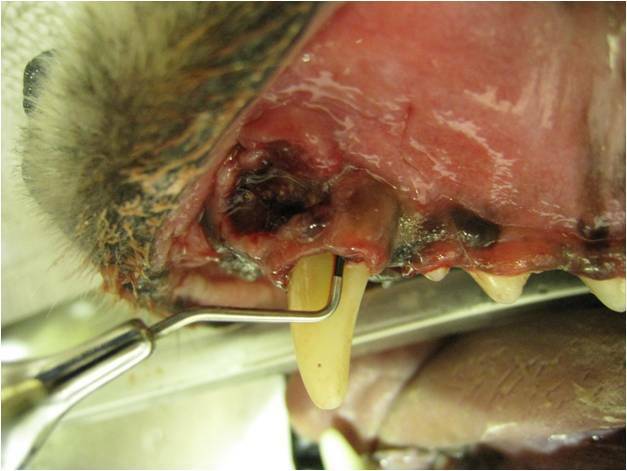 We are looking for abscesses (pockets of infection), evidence of disease, and evidence of oral cancer. A thorough exam also involves a magnified look at the teeth and gums, and careful probing of all the tissues around the tooth. This would require an awake pet to hold their mouth open and still for an extended period of time. Probing in diseased tissues would be painful and when we have such safe anesthetic protocols, it is not fair to ask our pets to be awake and subjected to pain. Sharp instruments are often used to remove the tartar and if your pet is awake and wiggles, the sharp tip could seriously injure their mouth. 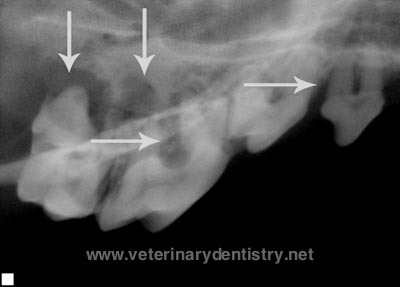 In addition, digital dental radiographs, which are essential for accurate diagnosis of oral health, cannot be done in an awake pet. Below are 2 pictures that illustrate how deceptive cleaning without anesthesia can be. The picture on the left is from a dog who'd had anesthesia-free cleaning. The picture on the right are xrays taken of the exact same teeth. 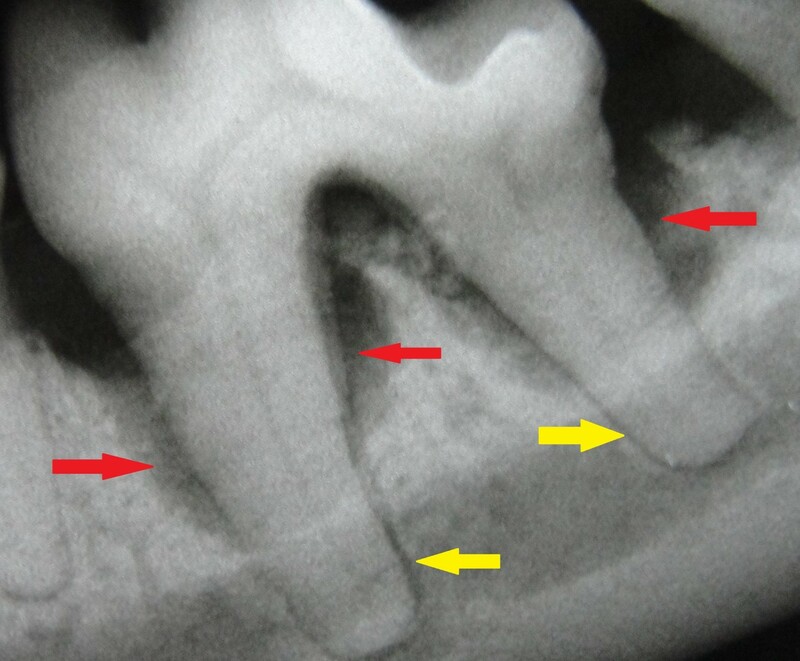 The arrows show areas of infection, bone loss and serious dental disease. Even though the teeth look great, they are actually not healthy and we can only assume that they are also painful, given the extent of the hidden disease. Anesthesia in the 21st century is much different than it was even 10 years ago. We assess each pet individually for its risk under anesthesia. We listen to the heart and lungs, ask about chronic diseases, and run blood work to ensure the liver and kidneys are healthy. Older pets may need to have radiographs of the heart and lungs before we will anesthetize them. Once we determine that your pet is healthy enough for anesthesia, our staff treats them with TLC and keeps them safe and cozy. Our patients are given warm blankets before, during and after their procedure; they receive warm IV fluids containing a constant drip of pain relieving drugs; they are given oxygen through an endotracheal tube (which protects their lungs); they are monitored for blood pressure, pulse oximetry (oxygen level in the blood), capnography (carbon dioxide level in the breath), EKG, and body temperature; and they are further closely monitored by a human being – a licensed veterinary technician – while the doctor performs dental procedures. If needed, we will administer local anesthetics for specific mouth regions and give drugs intravenously. My pet has bad breath but his teeth don’t look that bad, so I don’t think that’s the reason. 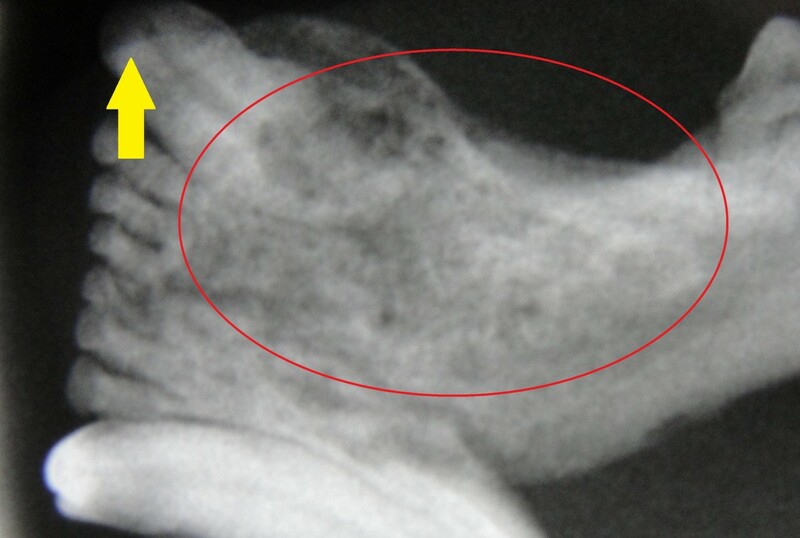 Most tooth abscesses are not visible, but can only be seen by radiograph as they may be deep in the bone. A thorough oral exam with radiographs should be done to determine where the smell is coming from. 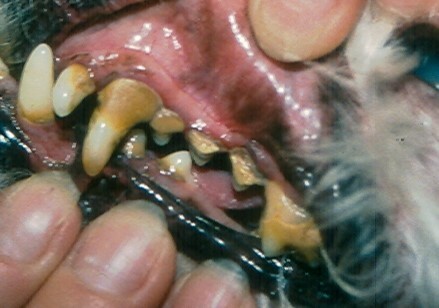 Also, some pets will get sticks or pieces of toy stuck between teeth, or pushed up under the gums. You may not see these if they are deeply embedded. Again, a thorough oral exam will help to find out what is happening. I’m afraid that if my pet’s teeth are cleaned, some might need to be pulled out. Teeth are not extracted unless they have lost a significant portion of their bony support, or have a deep root abscess. When the teeth are cleaned, and the oral exam and xrays show either of these conditions, then yes, they may need to be extracted. The cleaning itself will not cause either condition; those teeth have been in bad health for quite awhile. Some teeth can be saved, if the bone loss is not severe, but we won’t know that until the oral exam and radiographs give us more information. The red arrows show where there is disease causing bone loss. The yellow arrows show that the tips of the roots are still in healthy bone. This means this tooth doesn't need to be extracted now and with aggressive care, might be saved. My vet has said my cat may need many of her teeth out – how will she be able to eat? 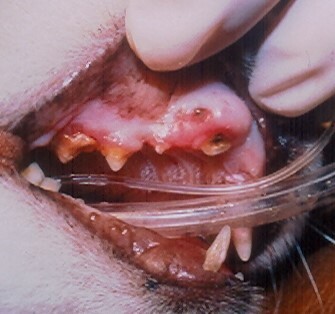 I have treated many cats that had all their teeth extracted, and after a few weeks, actually went in search of dry food to eat – once the gums heal, cat jaws are very strong and can be used for ‘chewing’. 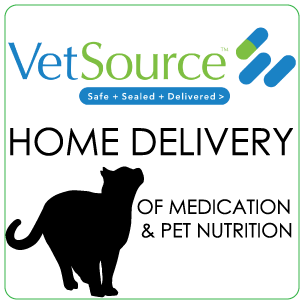 If your cat does not want dry food, then you can feed her soft canned food or semi-moist food and she will be fine. My vet says my cat has lost several teeth. If they've already fallen out, why does he need a dental exam? It is possible that the teeth broke off, and left sharp pieces of tooth under the gumline. These pieces could act like a splinter in your finger and cause pain and infection. Radiographs (xrays) will help us to see them even if they are deep in the bone. 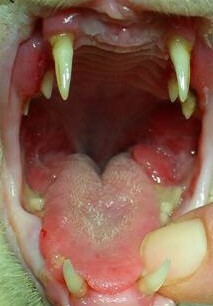 My pet’s teeth do look bad but he’s not having any trouble eating and doesn't seem to be in pain so why is it a problem? Toothache pain can be sharp and sudden, or can come on slowly and gradually with just a dull achy feeling. When the pain comes on slowly, pets often get used to it, and don’t react strongly. 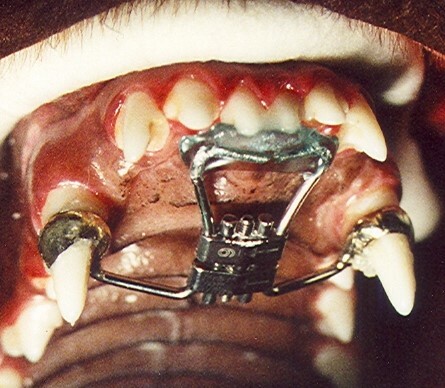 However, once those achy teeth are taken out, people see an amazing change in how their pet feels. We hear many stories of how the pet is now playing more and seems happier now that the teeth are taken care of. I can see that there is a broken tooth, but my pet isn't in pain so why should we do anything about it? It is possible that the tooth has been broken long enough that the nerve in the tooth has died. Once the nerve has died, the tooth does not feel pain. But, the broken tooth does allow bacteria to enter the bone around the tooth and enter the bloodstream. This doesn't hurt, but can cause abscesses or severe disease of the kidneys, liver, heart and other organs, and can cause local bone loss that spreads along the jaw and causes fractures (broken jaws). Your pet needs antibiotics and dental xrays as soon as possible. My cat isn't old but is already losing teeth. What can I do about that? The answer to this depends on why your cat is losing teeth.Tooth resorption can cause tooth loss as the structure of the tooth is slowly removed by the disease. Despite numerous studies the cause of tooth resorption remains unknown, which means we cannot prevent it. The treatment of choice is extraction to get rid of the pain that this disease causes. Periodontal disease can cause tooth loss also, because the disease causes infection and bone loss around the tooth, which then loosens the tooth. 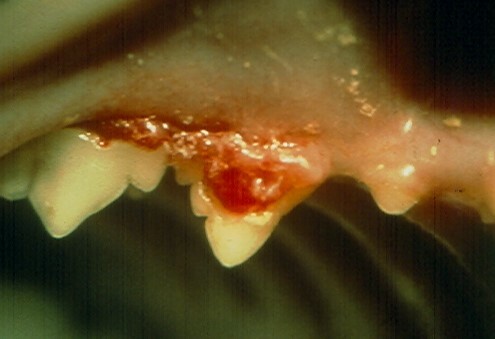 Periodontal disease is caused by bacteria accumulation and tartar/calculus buildup. It can be controlled with frequent professional cleanings and home care to reduce the accumulation of bacteria and tartar. My pet is old so why should we put him through a dental procedure? Decisions about scheduling dental procedures are done on a case by case basis. We consider the general health of the pet, look at laboratory results to confirm metabolic health, and combine that with our findings on oral examination on the awake pet. Old pets that are in pain from tooth abscesses are also feeling quite sick from the bacteria in their mouth. 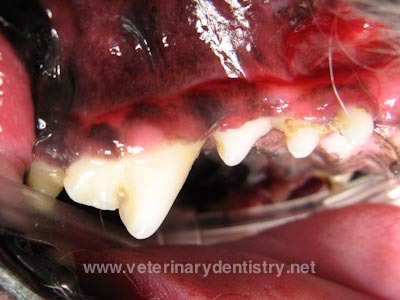 Leaving these diseased teeth in their mouth is hard on your older pet every single day, 24/7. Doing a dental procedure to treat the oral disease can make them feel much better which adds significantly to their quality of life. My dog has a broken tooth but I don’t want it pulled out – is there anything else we can do? Yes there is! We may be able to save the tooth by doing a root canal. During this procedure we clean all the bacteria out from inside the broken tooth and then fill it with sterile material and ‘cap’ it with a filling to keep bacteria out in the future. Radiographs (xrays) are needed to see if the tooth is healthy enough to receive this procedure. My pet isn't having any problems right now and I just can’t afford to pay for routine cleaning. Some oral problems can cause very subtle symptoms, so before you decide about the cleaning, be sure your pet has had a thorough oral exam with us. Hopefully everything is great, and a cleaning is not needed! In that case, be sure to provide home care to keep the mouth and your pet healthy. 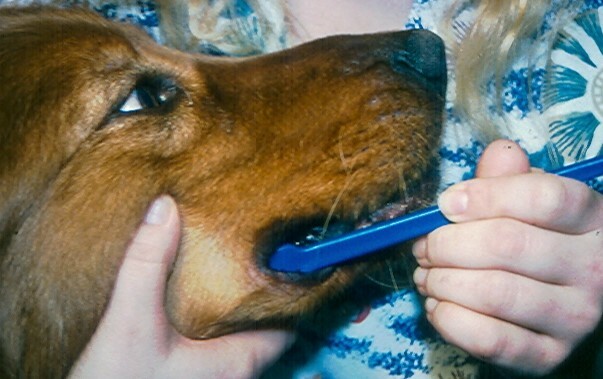 Brushing daily is best, using pet friendly toothpaste. We can give you tips and instruction on brushing, or recommend other ways to avoid progression of oral disease. Isn't it normal for an animal’s teeth to get dirty as they get older? Dirty teeth are a sign of periodontal disease. And periodontal disease is very common in our pets, even as early as age 5, so it seems to be ‘normal’ because we see it so often. If you did not brush your teeth or have your teeth professionally cleaned, it would be ‘normal’ for you to have very dirty teeth also. But you would not be healthy! With proper home care and professional cleanings, your pet can have fresh breath and a longer healthier life! My vet says that my cat’s chronic sneezing might be his teeth. I don’t understand how that would be. Your vet is very smart! Cats, and many dogs, have very little bone between their upper teeth and their nasal cavity/nose. In cats, it may be as little as 2mm, about the width of a pin head! When there is oral disease on upper teeth, the bacteria eat away at the bone and can actually then invade into the nose tissue, which causes infection and sneezing. The pictures on the left show how diseased teeth can cause upper respiratory symptoms. This cat had been treated with repeated rounds of antibiotics for symptoms that didn't resolve until the problems in his mouth were fixed. Why did you become a Veterinary Dentist? Isn't it boring to just clean teeth all day? Heavens no! Every pet has its own personality so it is always fun to get to know each patient. And although the diseases can be familiar, they aren't always the same in each patient, so every procedure is anew adventure as to what we might find. 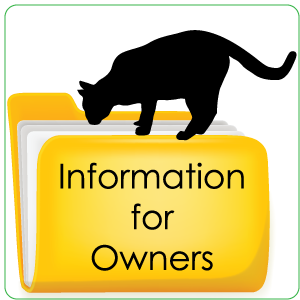 I also know that what I am doing makes a huge difference in the lives of both my patient and their owner – I have heard from so many happy owners that their pet ‘feels like a new dog/cat! They are playing and happy again!’ It is also very rewarding to provide root canals and crowns for police dogs so they can continue to catch the bad guys! And when I have a chance to remove an oral tumor so completely that the cancer does not come back – that is a great day! Many oral tumors grow so fast that pets need to be euthanized within months if they are not treated; giving the pet more years of life by removing the tumor is definitely a heartwarmer! I did help treat a lion and polar bear which is pretty cool. Both animals were at the zoo. The lion needed a root canal and the polar bear had broken a few of his teeth so badly we had to extract them. What’s the most surprising thing you've found in an animal’s mouth? Nothing has really surprised me yet… although I found a pebble embedded in a dog’s mouth once. Oh yeah, and a part of a bullet (the owner did not know the pet had been shot). That was a surprise! I have found needles, grass, sticks, bones, and plastic toys too.